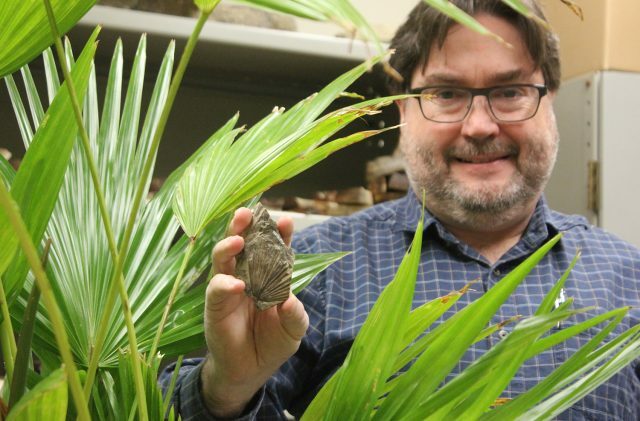 Dr. David Greenwood poses amongst living current-day palms in his lab, holding a fossilized palm from millions of years ago that he discovered was a new species entirely. Small palm-leaf fossils from Alberta, noticed by chance by Brandon University biology professor Dr. David Greenwood, dramatically expand the known range and evolutionary speed of these plants, which are important markers for past climate change. 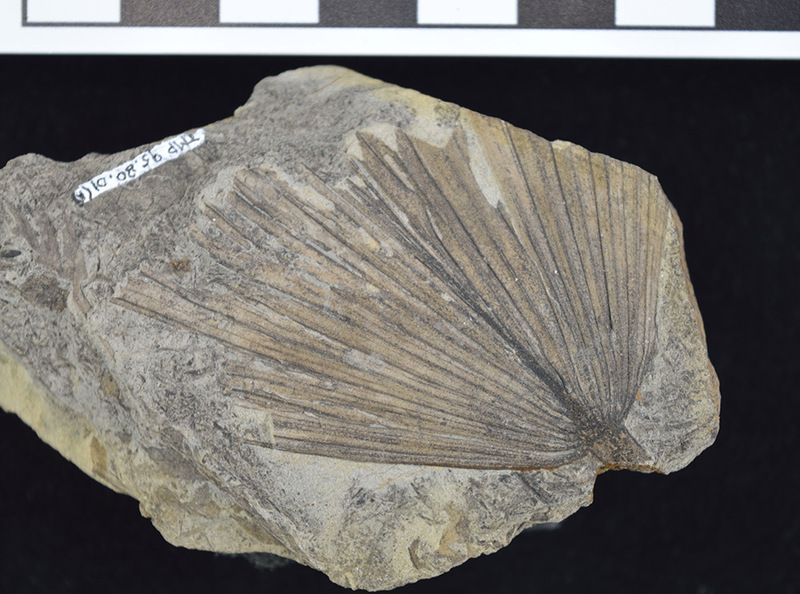 Dr. Greenwood, working with his graduate student, Christopher West from the University of Saskatchewan, has described an entirely new species of fossil palm, from central Alberta near what is now snowy cold Edmonton. The new discovery was serendipitous. Dr. Greenwood was searching through other fossil plant collections at the Royal Tyrrell Museum of Palaeontology in Drumheller, Alta., when he happened across the palm fossils. A close-up photo of a palm fossil that sheds new light on ancient climate in the North American interior. Originally collected in 1995 by scientists from the Royal Tyrrell Museum, these fossils were found in rocks that were deposited almost 65 million years ago, during the earliest Paleocene, a time just after the extinction of the dinosaurs. However, the fossils attracted little attention until Dr. Greenwood came across them. He says he was immediately drawn to their unusual size. The new fossils demonstrate that in the past, palms grew much further north than had been ever recorded east of the Rocky Mountains. Other plant fossils from the site reveal that this ancient Canadian palm grew within in a temperate broadleaf deciduous forest, in a warm and wet, but not tropical climate in Alberta about 65 million years ago. Prior to this study, the most northerly palm fossils from the North American interior were found in southern Montana. Most importantly though, this new fossil shows that coryphoid palms were already growing in temperate climates, 20 million years earlier than predicted from the molecular evidence from living palms. Today, many Canadians think of palms as typical in warm, tropical places, fringing Caribbean beaches, lining Rodeo Drive in Los Angeles, or shading golfing greens in Arizona. While the vast majority of palms are restricted to tropical areas, some palms do grow in more temperate climates, although they require human intervention to grow anywhere that winter temperatures routinely stay below freezing. Most of the cold-tolerant palms found today are fan palms, such as the California fan palm (Washingtonia). Palms, an ancient group of plants that arose during the latter part of the Mesozoic, approximately 110 million years ago, first grew in warm, subtropical to tropical environments alongside dinosaurs. The origins of the cool-climate fan palms, however, are a bit of a puzzle, with most of the cold tolerant palm lineages found within the coryphoid palms (subfamily Coryphoideae), including the sabal palms of southeastern USA, Mexico, and the Caribbean (the palm tribe Sabaleae), and the saw palmetto (Serenoa repens) of Florida, a member of the ‘trachycarpioid palms’ (the palm tribe Trachycarpeae). Prior studies of palm evolution based on molecular analyses of living palms showed that the most cold-hardy lineages of coryphoid palms — the sabal and trachycarpoid palms — seem to have evolved in North America sometime around the Eocene, about 48 million years ago, and then diversified and spread to South America, Europe and Asia over the following 10–20 million years. The most commonly planted cold-tolerant palm, the Chinese windmill palm (Trachycarpus fortunei) is planted today along the Vancouver shoreline, and in Victoria and other Vancouver Island coastal areas. This new discovery shows that these relative newcomer palms seem to be just reclaiming their ancestral haunts. Details of the new palm species were recently published in the Review of Palaeobotany and Palynology where Greenwood and West discuss the climatic implications of palm trees occurring so far north in Canada’s geological past. Related to modern coryphoid palms, the new fossil palm was named Sabalites geneseensis for the Genesee fossil site in Alberta, just south of the North Saskatchewan River, where the fossil was found. Palm fossils are not unknown from Canada, as palm fossils from the much earlier Cretaceous era have previously been collected from Alberta, and later Eocene palms have been found on the coast and interior of British Columbia. “The path to discovery begins with opportunity, requires expertise, and then judgement in realizing its importance. These are traits demonstrated by Brandon University’s Faculty of Science researchers,” states Dr. Austin Gulliver, Acting Dean of Science.